Build beautiful and realistic natural textures using ink liners and a brush pen. Drawing with ink produces vast possibilities. There are simple yet effective ways to create beautiful, organic textures, using only one colour of ink, which we'll explain in this workshop's text and in the video at the end. The theme of this black and white drawing is nature – an incredible source of inspiration. Use real objects for your artworks as often as you can. Collecting various natural objects – such as sea shells and snails' shells – make it possible for you to take a closer look, to touch and feel the surface. If you don’t have a real object, it’s great to use reference photos. Gather as many visual materials as you feel necessary, since they will nourish your artistic imagination and give you useful information about the texture and details. You could use these reference images and objects to create samples of textures before proceeding to the clean copy drawing. This is an excellent exercise for developing your artistic skills and power of observation. Ink liners are convenient because they are portable and clean, but if you would prefer, you can also follow the steps in this tutorial using nibs and liquid inks, because the principles are similar for both materials. Follow these 13 steps to create your own organic textured ink drawing. We'll begin this ink artwork with a pencil underdrawing. This method enables you to build the composition thoughtfully. Start drawing with light pencil lines and general shapes, then add the smaller features. As soon as you feel confident with your sketch and detailing, it’s time to start inking. 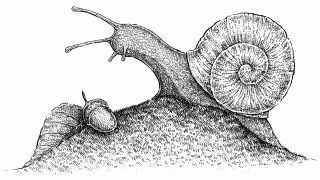 So to create a pencil underdrawing, first mark the hill and add rough shapes for the snail’s body and shell. Then draw the leaf and the acorn. The peculiarity of this composition is that the snail is looking at the acorn, as if with curiosity. As a final touch, refine the snail, adding the spiral of the shell and the horns. Using an SB brush pen, outline the contours with organic lines, varying the width from thin to thick (SB means ‘soft brush’ and provides a thin, flexible brush-like tip). Let your hand be relaxed and have fun. There is no need to draw all the contours with this tool, so leave some pencil lines uncovered. We will come back to them very soon. Use a small (0.3mm thick) ink liner such as this Faber-Castell Pitt Artist Pen, size S, to reveal the relief of the snail’s shell. On the image above, you can see two types of ink strokes: long rounded lines accent the prominent points of the shell, and groups of short hatches unobtrusively emphasise the three-dimensional aspect of this object. Begin the work on the texture of the moss that the snail is crawling along. With the S ink liner again, add groups of short hatches and dots to the hill area. The layering of hatches creates interesting effects and increases the contrast in the drawing. The closer you get to the bottom part of the artwork, the fewer hatches you should apply. This trick helps to create a beautiful fading effect. Add the texture of the snail’s body using an ultra-thin liner such as this 0.05mm Uni-Ball Pin Fineliner. This texture consists of small oblong elements that are closely adjacent to each other. Also add thin hatches to the area of the snail’s body under the shell. By carefully accenting the shadows like this, the drawing starts to look more realistic. Draw dots onto the shell using an ink liner like the Faber-Castell Pitt Artist Pen F liner. The groups of big dots will make the texture more interesting and credible. Then accent the sides of the shell and the borders of the spiral to give it more contrast and make it varied in terms of value (this means that you have darker and lighter objects). Add rounded hatches to the sides of the shell and near the spiral line, using the 0.05mm ink liner again. This type of hatching is also known as contour hatching, and it works perfectly for accenting the three-dimensional aspect of objects. Using the 0.05mm ink liner again, work on the snail’s body. Thin hatches help to reveal the relief of the animal and emphasise its three-dimensional qualities. The groups of parallel lines can go in different directions to form layers of hatching. This way of creating shadows is particularly good for black-and-white ink graphics. With the S liner again, add dots and rounded hatches to the acorn, accenting the sides of the object. It is important to leave a thin white line on the edge because that will separate the acorn from other objects in the drawing. Having this in place guarantees that the artwork will look realistic and three-dimensional. Add thin hatches to the acorn, using the 0.05mm liner. The goal is to give the acorn some contrast but to leave the highlights. Drawing with ink is a process of gradually raising the value and contrast, so it is better to apply fewer strokes at a time than too many of them at once. Now work on the leaf. With the S liner again, add some dots to create an organic, velvety texture. Dots always work well when it comes to natural objects and smooth surfaces; you can also use dots of different sizes in your artwork to achieve amazing graphic effects. Using the 0.05 liner, mark all of the dark places of the leaf. It is important to separate the leaf from the acorn with a distinct contrast shadow. Trust your eyes and hand; they will suggest the direction of hatching and the level of value in your drawing. Lastly, work on the relief of the mossy hill. Hatch with the 0.05 liner to create darker spots. Especially accent the shadow from the acorn and ensure that the borders between the objects in the drawing are clearly visible. Once that's done, the artwork is complete. Watch the video of this snail artwork coming together below. This article originally appeared in Paint & Draw issue 10. Buy it here.